Transparency Market Research has released a report, titled “global Smart and Interactive Textiles Market - Global Industry Analysis, Size, Share, Growth, Trends and Forecast, 2014 - 2020”, which delves into the proceedings of the smart and interactive textiles market from 2014 to 2020. The report states that the global smart and interactive textiles market will expand at a healthy CAGR of 14.0% from 2014 to 2020, for the market to reach a valuation of US$3.8 bn by 2020, increasing from US$1.5 bn in 2013. The research report is available for sale on the company website. Increasing demand for smart and interactive textiles from the transportation sector is slated to be a major growth factor of the market for smart and interactive textiles during the forecast period. With the continual advancement of the medical and healthcare sector, the smart and interactive textiles market will be benefitted due to the advantages of smart and interactive textiles in improving patient monitoring. However, the high prices of products manufactured from smart textiles is a deterrent to the growth of the market. Nevertheless, research and development undertakings that are carried out for product and technological innovation will open opportunities for the growth of this market in the coming years, says the report. Application and geography are the two criteria based on which the smart and interactive textiles market is divided in the report. With a share of more than 38%, transportation was recorded as the largest application segment of the market in 2013. In newer vehicles, features such as measuring heart rate, smart seat belts, heating of seats, and steering wheel functioning hold immense potential for smart and interactive textiles in the automotive industry. Other than this, the industrial application segment contributes a significant revenue to the overall market. The segment will rise at a phenomenal CAGR of 17.30% from 2014 to 2020 due to the modernization of industrial activities, especially in the emerging regions of Asia Pacific. In the industrial application segment, protection equipment used for personal safety, which are extensively used in manufacturing facilities, industrial plants etc., account for a large share of the demand for smart and interactive textiles. Among the regional segments, Europe is the largest market for smart and interactive textiles, the region being an established base for industries catering to the transportation, healthcare, and military sectors. 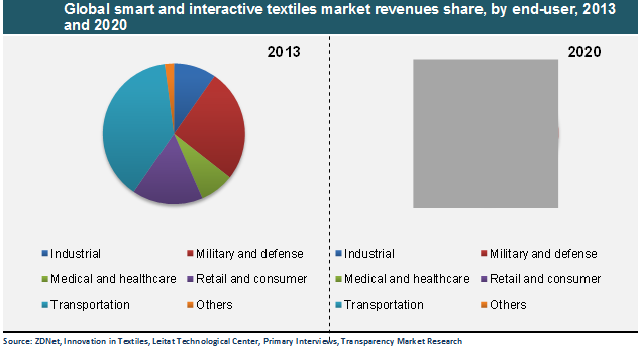 In 2013, the smart and interactive textiles market in Europe was worth US$632 mn. In addition, funds granted from the European Union (EU) for the use of smart textiles for healthcare and defense services has led to further growth of the Europe smart and interactive textiles market. However, it is the emerging economies of Asia Pacific that will exhibit the fastest growth during the forecast period. Currently, the smart textiles market in Asia Pacific is nascent; however, the modernization of the textile industry to cater to the advancing healthcare sector in the region will lead to higher production of smart textiles, which in turn will be favorable for the smart and interactive textiles market.